SOMERSET, N.J., Aug. 26, 2015 – Twenty-five percent of men currently taking finasteride or dutasteride (brand names Proscar and Avodart) for the treatment of benign prostate enlargement (BPH), appear not to benefit from taking these medications. Those prescribed Propecia or Avodart for male pattern hair loss are also at risk for adverse events elicited by these drugs. These findings are part of an international, collaborative review currently online in the journal Endocrine Reviews and Metabolic Disorders. 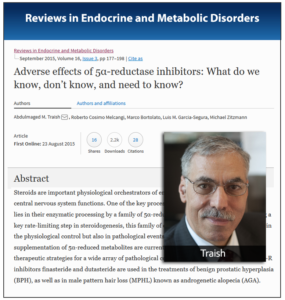 Led by Abdulmaged Traish, PhD, professor of biochemistry and urology at Boston University School of Medicine (BUSM), the paper summarizes current available data and the impact of these drugs on sexual function, as well as insulin resistance, depression and cognitive dysfunction. Finasteride and dutasteride are in the family of drugs known as 5α-reductase inhibitors (5α-RIs). They function by inhibiting the conversion of testosterone to 5α-dihydrotestosterone (5α-DHT) as well as several other critical steroid hormones. By reducing the concentration of 5α-DHT in the prostate, prostate volume decreases thus improving urinary flow. Considerable controversy exists regarding the severity and persistence of the adverse effects of 5α-RIs, but emerging clinical evidence strongly suggests that therapy is associated with sexual adverse side effects. The package insert for finasteride reports a libido loss and/or reduction in 10 percent of patients and erectile dysfunction in 18 percent. In some patients, these effects can remain even after stopping therapy. According to the researchers, the suggestion that sexual side effects appear early in the first six months of therapy and then return to baseline is inaccurate. "The mechanism of dysfunction is likely multifactorial, related both to the direct decrease in 5α-DHT and direct influence on central and peripheral nerves," says Dr. Traish. In addition to sexual side effects, there has been some investigation into whether 5α-RIs can be used for prostate cancer chemo-prevention. But the researchers found the data to be inconclusive. They also believe the potential for cardiovascular side effects of therapy to warrant further investigation. "Inhibition of 5α-R activity may potentiate insulin resistance, type 2 diabetes, vascular disease and osteoporosis, but studies have not been definitive. The investigation into psychiatric side effects of 5α-RIs has been limited, but some case series describe increased depression and anxiety symptoms among patients on the medication," says Dr. Traish. The U.S. National Institutes of Health recently added post-finasteride syndrome (PFS) to its Genetic and Rare Diseases Information Center. Specific diagnostic criteria have not yet been described for the PFS spectrum. Further studies on PFS are needed to determine any relationship between dosing and severity of long-term side effects, he advises. The authors contend that increased education and awareness of the adverse side effects of 5α-RIs is needed among clinicians and patients alike. "There needs to be a method of distinguishing who may benefit from therapy from those who will not," says Traish.